Following our walk last Sunday I asked Mark if he could write down a few notes from his observations on his visit. Firstly and probably most importantly it does not appear that the park started life as a medieval deer park. Dagnams is mentioned in Reaney's ‘The Place Names of Essex ‘as early as 1378 but it seems likely that this refers to a building rather than a park as well. No park is indicated on the John Norden map of Essex (1594 ) but Dagnams is located on the map ; similarly the Joannes Blaeu map of 1645 does not show a park but once again a Dagnham Little is depicted as a wooded area but not strictly speaking a park as no park pale (fence ) is indicated as is given for other parks on the map . It is certain as is indicated by the Chapman & Andre map of 1777 that a park was in existence at that date . I suspect that Dagnam park is thus a late 17th or 18th century park. The date of a park's creation is very important to an understanding of its trees – medieval parks like Windsor often have huge pollard oaks sometimes twenty or thirty feet in girth and perhaps seven or eight hundred years old …..later parks usually lack such trees. It is however worth noting that later parks sometimes incorporate very old trees from hedgerows on land that has been added to the park at a later date and it is not uncommon for medieval parks to have had their old pollard trees removed at some stage as at Marks Hall near Coggeshall . Trees occur in three basic management forms at Dagnam Park – pollard , coppice and standard . The pollard trees are the oldest , some of these may even pre-date the creation of the park and were incorporated when the park came into existence . Pollards were created in areas destined to become wood-pasture , that is where grazing animals would be allowed to roam. They were cut at 6 – 10 feet above ground level so that the re-growth , to be used for firewood , would not be browsed by livestock. Hatters Wood was originally a coppice with standards woodland and as such it was a separate entity from the park . It is shown on the 1777 map separated from the park by the park pale, it was only later added to the park . Near the Tring Gardens side of the wood there are some fine Hornbeam coppice stools – these probably survive from the original wood . Coppice was cut at ground level , it was much less hard work than pollarding ; the re-growth was protected from livestock by a fence or hedge which would have surrounded the wood . The standard trees provided structural timber for buildings and were a very valuable product , particularly in a county like Essex which had little natural building stone. These trees were obviously left , possibly for over a hundred years before being cut . Interestingly at some time after 1777 part of Hatters wood was grubbed up and a modern type plantation was created in its place . Once again the plantation would have provided a valuable timber resource . Typically for a later park, Dagnam has a number of fine planted specimen trees , a number are common in parks all over Essex – these include Beech , Horse Chestnut , Yew and a probable Cedar of Lebanon . The Wellingtonia was the classic Victorian addition to virtually every park in Essex , it was the ‘must have ‘ fashion accessory . 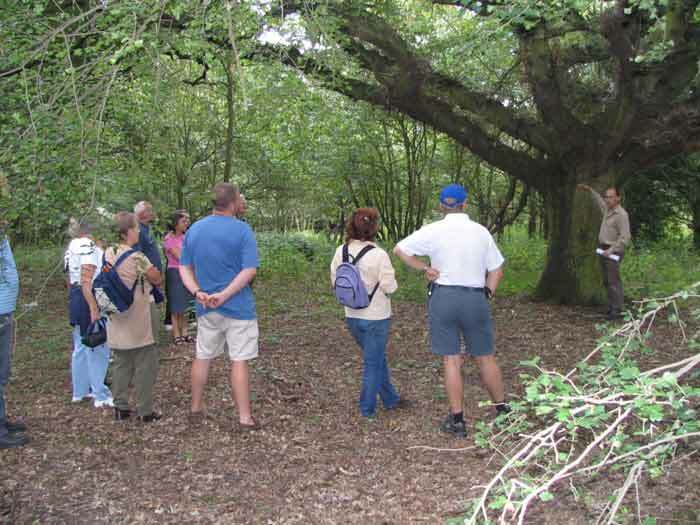 Below Mark Hanson the author of "The Parks of Essex" uses an Oak pollard to explain why trees were pollarded as he leads a group of the friends around the park. The weather was fine and Mark described the principles of coppicing and pollarding as well as pointing out some of the park's notable trees. These included the Mulberry, Wild Service Tree, Sequoia and Cedar as well as three species of Oak. An informative afternoon, which included information on the famous landscaper Humphry Repton who was involved in some early design in the park, he lived in Hare Street, Gidea Park in the early 19th century. Our thanks go to Mark for giving up his Sunday afternoon to our advantage.